New Horizons 101. 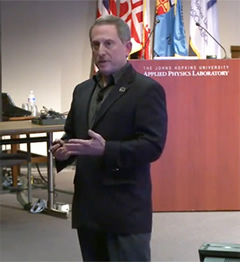 New Horizons Principal Investigator Alan Stern discusses the first mission to Pluto and the Kuiper Belt during a public lecture in APL’s Kossiakoff Center on July 23. “We live in a special place,” he said. “Only the United States is capable of exploring the outer solar system...we are rewriting textbooks that kids will read all around the world.” Watch the video. Compressing eight decades of discoveries into five days, more than 100 scientists met last week at the Johns Hopkins Applied Physics Laboratory (APL) in Laurel, Md., to talk everything Pluto – what we already know, what we’d like to know, and what data we expect NASA’s New Horizons spacecraft to deliver after its historic flight past the distant planet in the summer of 2015. Led by New Horizons Project Scientist Hal Weaver, of APL, the New Horizons team organized the meeting – The Pluto System on the Eve of Exploration by New Horizons: Perspectives and Predictions – from July 22-26 to bring the diverse range of knowledge and views about the Pluto system to one forum. They also invited ideas for ground-based and satellite observations that could supplement the New Horizons encounter, and shared details of the mission and spacecraft with scientists from the U.S. and other countries interested in analyzing the data returned from New Horizons. The meeting included 103 talks, 30 poster presentations, and 13 topical sessions covering nearly every imaginable aspect of the Pluto system, including atmospheres, moons, dust and rings, magnetospheres, surface composition and geology, system origins, surface-atmosphere interactions, Kuiper Belt context, and, of course, the planned New Horizons encounter. New Horizons Principal Investigator Alan Stern, of the Southwest Research Institute, said a variety of papers presented at the conference will be submitted to the journal Icarus. Stern also told participants to mark their calendars for a summer 2017 science conference to digest New Horizons results; New Horizons makes its closest approach to Pluto on July 14, 2015, and will need about a year to send home all the uncompressed data from its digital recorders. Deliveries to the Planetary Data System are also planned in 2016 and early 2017. New Horizons Deputy Project Scientist Kim Ennico covered the conference from start to finish; read her blogs here. The Twitterverse was alive with Pluto Science talk throughout the week. Read the abstracts from the meeting (12 MB PDF). How many planets? 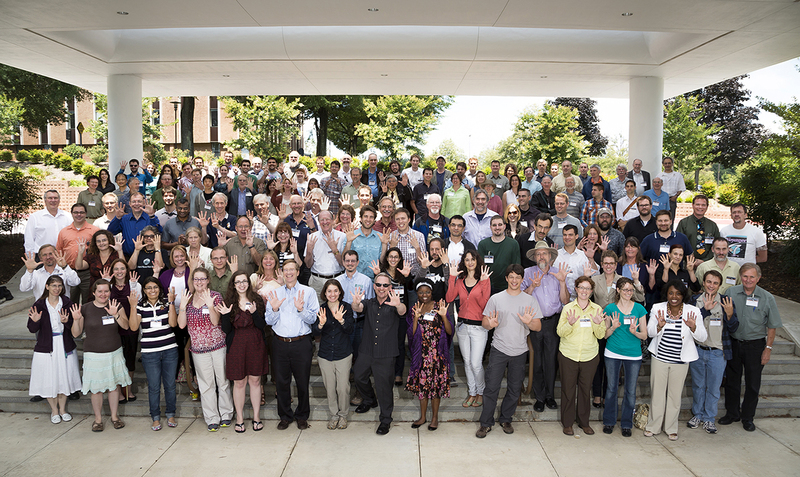 Pluto conference scientists – holding up nine fingers – express their opinion on Pluto’s planethood.